Hurricane Nate slammed into the southeastern tip of the US state of Louisiana on Saturday and headed toward Mississippi after leaving dozens dead and causing widespread flooding in Central America. Officials urged residents to evacuate some vulnerable areas before the storm made landfall on Saturday evening, and residents scrambled to make last-minute preparations ahead of the third hurricane to hit the southern US in less than two months. 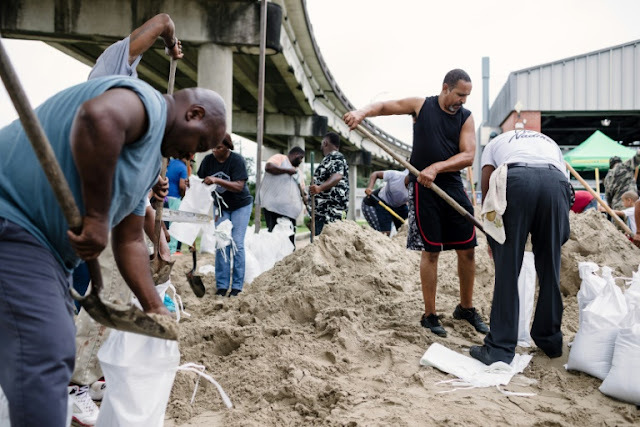 But US President Donald Trump said federal officials were ready for the fast-moving storm, urging residents of the states of Louisiana, Mississippi, Alabama and Florida on Twitter to "listen to your local authorities & be safe!" "The center of Hurricane Nate is now making landfall at the mouth of the Mississippi River," the US National Hurricane Center (NHC) said at 7:00 pm Saturday (0000 GMT Sunday). "On the forecast track, the center of Nate will make a second landfall along the coast of Mississippi tonight. After landfall, the center of Nate is expected to pass over portions of Mississippi, Alabama, and Tennessee late tonight through Sunday night," the NHC said. If it moves as forecast, the worst of the storm will bypass New Orleans, which was ravaged by deadly Hurricane Katrina in 2005. AFP / Bryan Tarnowski Firefighters unload supplies as New Orleans readied for Hurricane Nate, which now appears set to bypass the city. The storm, a Category One hurricane on the five-level Saffir-Simpson scale, with winds swirling at up to 85 miles (140 kilometers) per hour, had slowed slightly from its earlier pace, heading north at about 20 miles per hour, the NHC said. The forecast warned that "the combination of a dangerous storm surge and the tide will cause normally dry areas near the coast to be flooded by rising waters moving inland from the shoreline." With widespread electrical outages expected, New Orleans-area power provider Entergy prepositioned repair crews to go to work once the hurricane passed, and warned that outages could last up to a week. 0 Response to "AFP Latest News: Deadly Hurricane Nate hits southern US"